Poultry meat production keeps on increasing, in spite of the higher availability of other meats, according to the latest EU research. Poultry meat has been expanding steadily for several years and, for the time being, there are no signs that 2014 and 2015 will be an exception. Lower feed prices, reduced pig meat availability and sustained demand are expected to drive the 2014 production up by 1.9% compared to 2013.
problems in the UK on hygiene conditions could have a negative impact on the domestic consumption. The recovery expected in beef and pig meat production in 2015 could limit the expansion of poultry meat to 0.7%. markets. Therefore, 2014 imports are expected to decline (-3%) for the second year in a row and to remain at this level into 2015. 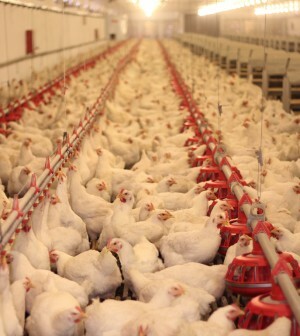 Exports of poultry are expected to decline as well for the second year in a row. The slight increase registered in the first part of the year was mainly driven by Russia, which was compensating for lower pig meat supply. The introduction of an import ban on poultry too stopped this possibility. Increased demand from South Africa, Philippines and Hong Kong will not be able to outstrip the declines in volumes to Saudi Arabia, Ukraine, Yemen and Ghana (and the closed Russian market). After reaching record levels above 200 €100kg in the summer of 2013, the EU average price for poultry meat developed within a range of €187-197/100kg; from €196/100kg in July 2014 it moved in the second half of August to €193/100kg, the same level as the 2009-13 average; however, this small decrease is not directly linked to the Russian ban: feed costs have been declining and prices have adjusted downwards to the increased production. Increased production over the outlook period and consequently lower prices should stimulate further domestic consumption to reach the level of 21.8kg/capita (retail weight) by 2015.